The bull takes center stage for this year’s Bot River Spring Weekend festivities hosted on 1 and 2 September by the region’s fun-loving and fancy-free wineries. For a faBULLous foretaste of what to expect in your glass at this year’s Bot River Spring Weekend, join the clan of amicable winemakers who will descend on Cape Town on Wednesday, 29 August to share their latest cellar gems with enthusiasts. This once-off public tasting will take place at La Tête Restaurant, 17 Bree Street from 18h00 to 21h00. Tickets are limited to 150 seats and cost R200 per person and include a glass, wine tasting and some decadent pairings from the kitchen. This doesn’t however involve running with bovids of any kind. Rather, the highlight of highlights Bull Race takes the form of a scavenger hunt for grown-ups. Hosted by the Gallivanting Goose, participants are required to complete challenges prompted by a mobile phone app. This is your chance to learn more about Bot River and win cool prizes too. The game is limited to 40 people only, so rush to book forthwith! You’ll also have to navigate the rest of your schedule with care if you’re to get to all else that catches your eye that weekend. No bulls in china shops can succeed! Bot River Barrels & Beards tackles bull by horns for charity - Demand soared to R175,000 at 2018 ‘Best of Bot’ charity auction. A mob of beastly bearded Bot River winemakers grabbed the proverbial bull by the horns, when its annual Barrels & Beards showcase took centre stage in the Overberg wine hamlet, all in aid of charity. Each year the Bot River Barrels & Beards, fuelled by an energetic spirit of originality, promotes the small region’s outstanding wine and maverick character and puts the stubble that accumulates on winemaker chins during harvest to good use. The 2018 event topped its predecessors with increased sponsorship from premier wine closure company Amorim Cork. “Along with the well-cultivated facial hair, this year’s line-up had everything - stand-up comedy, fancy-dress, introspective drama and, as usual, some energetic musical showmanship. Each act brought an element of inspired originality, so it was difficult to select one. But at the end of the day, Kobie Viljoen’s natty dress and fleet-footed dance-moves stole the show. He was a worthy winner of the first Amorim Cork Bull Trophy, designed by Laurie Wiid of Wiid Design for Barrels & Beards. He looked so proud holding that trophy I am sure he is not going to give the title away easily next year,” says Amorim Cork MD and Barrels & Beards sponsor Joaquim Sá. Some of the desirable items that went under the hammer included a Platter’s five-star wine and one of only six ever produced: a 5-litre bottle of Beaumont Wines Hope Marguerite 2016. The chance to be “wined and dined” by Luddite Wines’ incomparable winemaker Niels Verburg - in his Blue Bulls Barrels & Beards outfit nogal!. And a whole Overberg lamb from none other than 2016 Western Cape Farmer of the Year Josias le Roux, of local Langhoogte farm. The wineries of Bot River invite you to join them for their fifth annual Barrels & Beards Harvest Celebration from 15 to 16 April. The 2016 vintage is in full swing, leaving not a spare minute in the day of a Bot River winemaker for trivial things like personal grooming. About six years ago, Niels Verburg of Luddite decided to fully embrace this spin-off of harvest-time, and challenged his winemaking compadres to a bit of a beard-off. It was so ridiculous that the rest of the Botriviera took to it like olives to a martini, and here we are today. Enthusiasts are invited to delight and indulge in a weekend filled with beautiful wines, badly behaved beards and bona-fide bountifulness when we celebrate the 2016 Harvest. Weekend warm-up at Honingklip: Friday 15 April, 18h00 at R180 per person – includes artisanal “beer from a barrel” and home-made pork sausages. Best of Bot River Tasting: Saturday 16 April, 10h30 at R350 per person – includes prestigious tasting and light lunch. 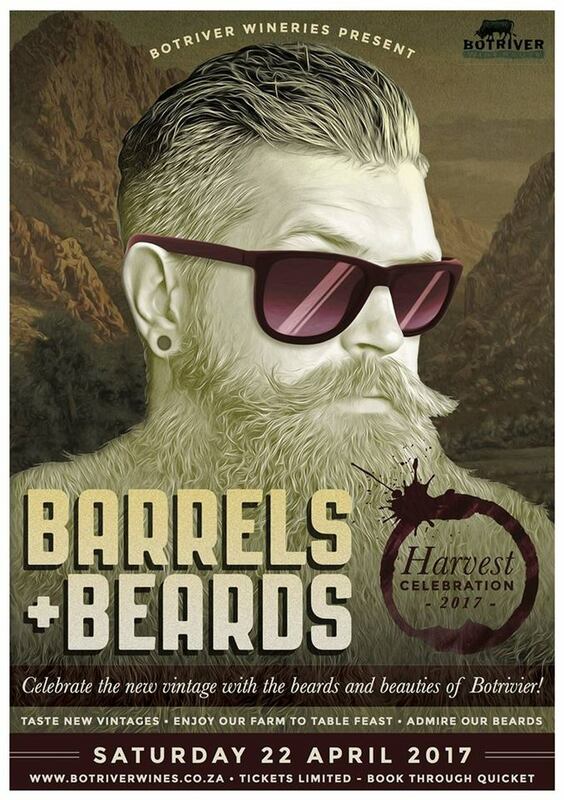 Bot River Barrels & Beards Harvest Celebration: Saturday 16 April, 17h00 at R450 per person – includes a glass, barrel and older vintage tastings, dinner and the Beard Parade. 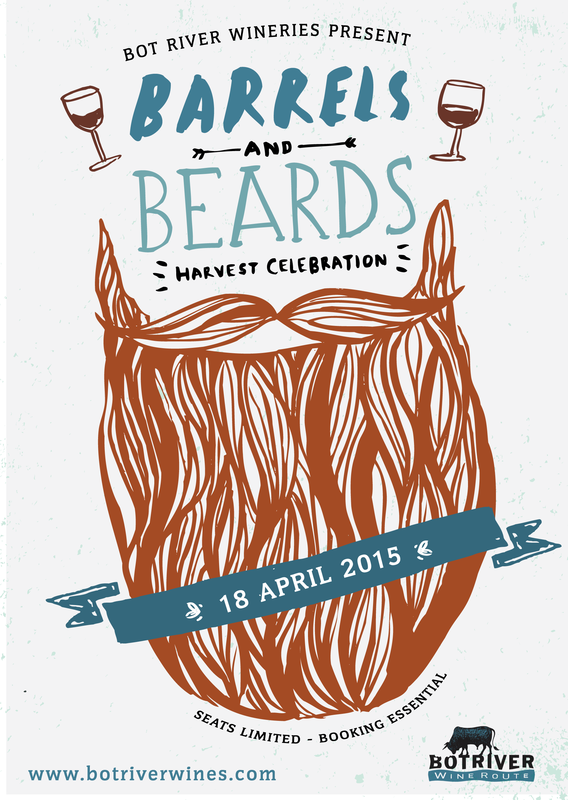 Delight in a weekend filled with bold wines, raging beards and genuine hospitality when the wine community of Bot River in the Overberg celebrates their harvest with a trio of unique events, culminating with their signature Barrels & Beards showdown on Saturday, 18 April 2015. Your expedition into the laager of this winemaking clan kicks off with a laid-back, sunset session on the ‘stoep’ of the legendary Bot River Hotel on Friday evening, 17 April. One can ease into the weekend a la Bot River style and mingle with the locals over a few beers, and then amble over to the rustic Shuntin’ Shed for wood-fired pizzas ‘on the tracks’. The winemakers will be there in their bearded glory, so be sure to grab a seat next to one to find out what makes Bot River tick. Saturday morning, 18 April, tempts the more serious winos and cellar buffs to attend a Best of Bot River Tasting at Luddite Wines, owned by affable winemakers Niels and Penny Verburg. During this enlightening tasting, a selection of terroir-driven Bot River wines will be ‘blind tasted’ against international wines of the highest standards ranging from rare Rhône vintages to New World gems. The weekend concludes with the ever-popular Bot River Barrels & Beards post-harvest celebration when the winemakers’ self-imposed shaving ban (which starts on 1 February 2015 and lasts throughout the entire harvesting period) ends on a high and hairy note at the family-run Beaumont Estate on Saturday evening, 18 April. At this annual celebration of good food, wine and company the winemakers flaunt their facial fur and wacky whiskers during an amusing ‘beard parade’ when the boldest beard in Bot River is crowned by esteemed judges – who take their job very seriously. A new addition to this year’s hairy hullabaloo will be the launch of an exclusive Bot River Auction Reserve 2013 wine, which will be auctioned off on the evening. For one night only, guests will have the opportunity to get their hands on this premium red blend, made with only the finest grapes from the Bot River area, with proceeds going towards paying for an extra teacher for Bot River Primary School. Only 100 magnums and 300 750ml bottles will be produced to go under the hammer. Besides a chance to get your piece of this Limited Release action, the Bot River Barrels & Beards 2015 party includes complimentary barrel tastings of the latest wines, a hearty farm-to-fork dinner and music entertainment led by a lively marimba band. Wines will be on sale on the evening. Cellars to take part in the Bot River weekend include the likes of Barton, Beaumont Wines, Benguela Cove, Eerstehoop, Feiteiras, Gabriëlskloof, Genevieve MCC, Goedvertrouw, Luddite, Maremanna, Rivendell and Wildekrans. Bot River, a mere hour’s drive from Cape Town, has long been a haven for wine industry pioneers and mavericks, with 13 wine farms (most of them family-run) producing world class wines. This quaint 10 km enclave is known for its conservation initiatives, a ‘chilled’ approach to life and honest, hands-on wine-making methods. Tickets are (very) limited, so be quick! Call it hairy or somewhat scary, but for the close-knit winemaking community of Bot River in the Overberg, its annual grape harvest comes with a self-imposed shaving ban throughout this strenuous period. 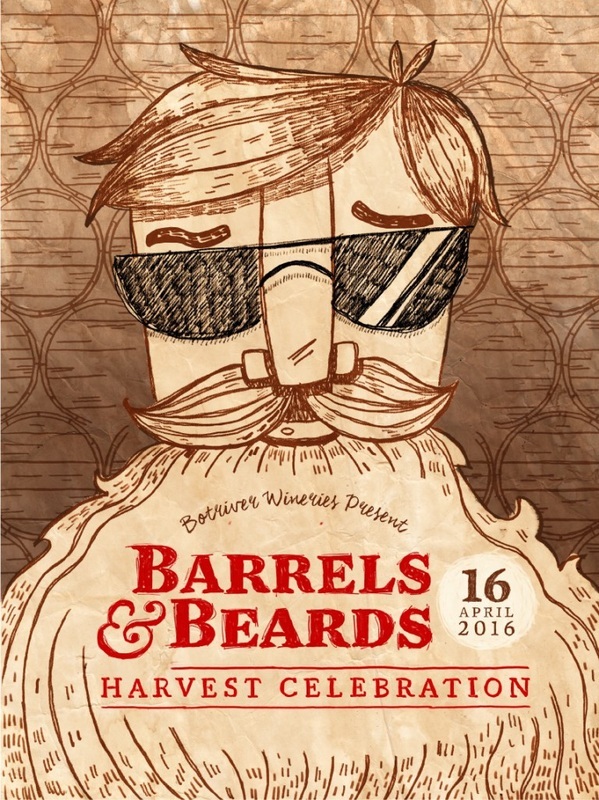 This year the luxuriant growth of post-harvest facial fur and wacky whiskers will once again be revealed at its annual Barrels & Beards celebration on Saturday, 5 April 2014. 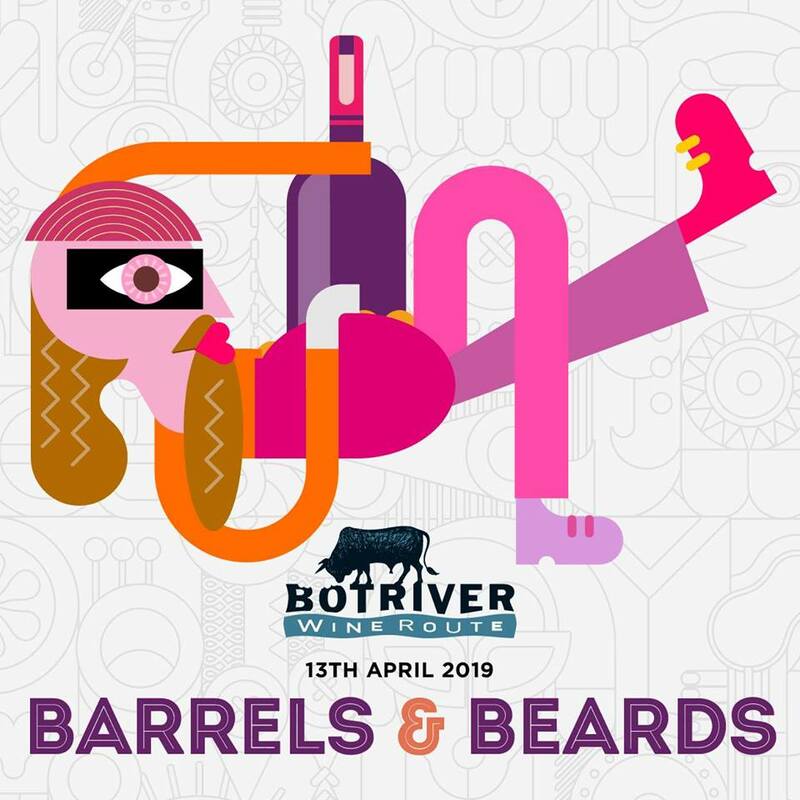 Now in its 3rd year, the ever-popular Bot River Barrels & Beards, one of the quirkiest wine events on the circuit, invites enthusiasts to share in the fruit of the winemakers’ labour and to have fun with the locals at the same time. Themed ‘The Good Old Way’, the 2014 event features barrel tastings of the latest cool-climate, quality wines from this unspoilt Winelands pocket and a raging beard parade and ‘formal’ judging of the boldest beard in Bot River. Guests will also indulge in a terroir-to-table three-course dinner of unique tastes and produce from the area, accompanied by foot stomping entertainment by a lively marimba band and the ever-green boereorkes, Die Stoepsitters. “By virtue of where Bot River is located, between Hemel en Aarde and Elgin, we always need to be a little different to get attention and so the Barrels & Beards was born. One can’t be too ‘fancy pants’ about wine. It is there to be enjoyed and what better way to celebrate the end of harvest and all the hard work that’s gone into it!” shares Penny Verburg of Luddite and Chair-person of the Bot River Wine Route. Bot River, a mere 1 hour’s drive from Cape Town - or 30 mins from Hermanus - has long been a haven for wine industry pioneers and mavericks, with 13 wine farms (many of them family-run) producing world class wines. In addition this underrated, unpretentious 10 km enclave is also known for its conservation initiatives, a ‘chilled’ approach to life and honest, hands-on winemaking methods. Cellars to take part in the 2014 hairy hullabaloo include the likes of Barton, Beaumont Wines, Eerstehoop, Feiteiras, Gabriëlskloof, Genevieve MCC, Goedvertrouw, Luddite, Maremanna, Rivendell and Wildekrans. Wines will be on sale on the evening. Events sponsors include Wesgro and Amorim Cork, South Africa’s largest natural cork supplier and the best beard on the evening will win a kayak, golf bag or surfboard made from cork – depending on the winner’s choice. “Bot River ranks amongst the most exciting Winelands destinations, having defiantly maintained our own distinct, laid-back identity. And we invite everyone to come and celebrate with our winemakers as we flaunt our whiskers and wines,” adds Sebastian. Barrels & Beards 2014 takes place at The Old Shed at Anysbos Farm on the Swartrivier Road, Off the N2 and starts at 17.00pm. A shuttle service (departing from the Botrivier Hotel) will be available on the evening in support of responsible drinking. Seating is limited to 200 guests and if last year’s sell-out success is anything to go by, tickets will be flying fast so get yours today. Tickets cost R270 per person and include complimentary barrel tastings of the 2014 wines, a souvenir wine glass, dinner, music entertainment and real country hospitality. For more information or to book your tickets contact Nicolene Heyns at nicolene@botriverwines.co.za or call 082 852 6547. Each year the laidback wine folk of this prized yet unspoilt Winelands pocket in the Overberg, follow a tradition of ‘no shaving or barber visits for the duration of the harvest season’, only to reveal their scruffy facades during a fun-filled ‘beard parade’. And this year’s event promises one big hairy hullabaloo. Along with esteemed judges, guests will get to vote for the boldest beard in Bot River and sharing the spotlight with raging beards and monster mo’s will be the latest 2013 cellar gems to be sipped and savoured straight from the barrels. “We only get one chance a year to make the best wines we can and we invite enthusiasts to come and rub shoulders with our winemakers as we flaunt our whiskers and wines,” shares winemaker Sebastian Beaumont of Beaumont Estate. “At the Barrels & Beards evening we pay tribute to the pampering that went into our wines and not ourselves over the past few months,” adds bubbly beaut Melissa Nelsen, proprietor of Genevieve Cap Classique. This exclusive evening includes a hearty ‘terroir to table’ potjiekos dinner of unique tastes and produce from the area, whilst cool-climate, top quality wines from more than eight local producers will be on sale. The ‘boereorkes’, Die Stoepsitters, will add sakkie-sakkie vibes to this homegrown affair. A shuttle service will be available on the evening in support of responsible drinking. If last year’s sell-out inaugural Barrels & Beards event is anything to go by, tickets will be flying fast so make sure you get hold of yours today. Tickets costs R250 per person and include a complimentary barrel tasting of the latest Bot River wines, a souvenir wine glass, dinner, music entertainment and real country hospitality. Seating is limited and no kids under 12 allowed. Bot River is situated en route to Hermanus on the N2 – a mere hour’s drive from Cape Town. Wineries of Botriver celebrate together! 9 – 11 September 2011 - A fabulous weekend celebrating the advent of Spring for wine lovers, nature lovers and families to get together for the good-time event of the year with gastronomy, tastings, entertaining activities , local artists and so much more. Our line up this year kicks off with the Winemakers Selection on the 9th September 2011 to be held at Kol Kol Mountain Lodge, Bot River, tranquil with sweeping views of fynbos. Winemakers will be showcasing their wines revealing unique perspective on vine-to-glass progression and the personality of Bot River terroir complemented by culinary delights. Partygoers can shunt their cabooses over to the Bot River Station on Saturday 10th September for the Botriviera Spectacle. The theme is ‘carnival’, an excuse for guests to puff up their feathers and pimp their style for an evening of other-worldly and downright surreal entertainment. The party will be fuelled by DJ Charl who returns this year to rock the rails and steam up the venue. The loco-motion starts at 7 pm and the party will go on till late. Tickets cost R100 and includes entry to the lucky draw and amazing giveaways. Bot River is only 1.15h Cape Town so whether one is visiting for a day or spending the weekend on one of the participating estates the Botriviera Spring Weekend provides an opportunity to discover and explore this fascinating area, meet the merry winemakers and enjoy their wines! Join us and explore something out of the ordinary.